Manufacturing and robotics are natural companions, and the images of rigid, single-arm robotic installations on a factory floor are very familiar. The new breed of robots, however, is more mobile, more integrated with human activities, and—most important—can learn new skills and generate new insights on-the-job. These new-generation robots are not confined to a single workspace or task; they can both learn from and generate real-time data that flows through control, planning, and logistics systems. What is the end result? Both they and their human counterparts can make better decisions, sometimes in milliseconds, which improve productivity, safety, profitability, and product design. These human-robot partnerships can cause dramatic shifts in how manufacturers work and the skills they require. Far beyond just acquiring a robot, manufacturers will need to design holistic strategies that combine innovative thinking, workflow design, operational integration, collaborative partnerships, advanced analytics, and an anthropological sensitivity for how human workers think and feel. The current generation of robots, often referred to as collaborative robots, is designed to safely share workspace with humans, aiding in and collaborating on a variety of tasks, from inserting shock absorbers to packaging medical supplies. With prices averaging less than $30,000 per unit today (and expected to drop to less than $18,000 by 2020), according to Barclays, these robots are relatively afford­able, even for smaller and medium-sized organizations. Collaborative robots are also designed to collect and share data in real time with different systems, such as manufacturing execution systems (MESs) and warehouse management systems (WMSs). System interfaces are facilitated through supervisory control and data-acquisition (SCADA) systems on the shop floor, leveraging an “information bus” construct with programmable-logic-control (PLC) layers. Further, built with advanced vision systems, lasers, and sensors, as well as limited cognition and self-programming capabilities, many of these robots can take in ambient data—temperature, humidity, speed of the line, etc.—and make decisions about their next best course of action, then execute on it, all in a millisecond or less. Human-robotic partnerships can potentially extend to any process involving a physical flow of materials, whether making finished goods, kitting, or packing and shipping. They could even augment post-production inspections. For instance, in an aircraft factory, a human supervisor could inspect the finished product, and then direct a robot to take a detailed inventory of faults. In turn, that robot could summon other robots to the area to ensure that section of the airframe is fully surveyed while it follows the human leader to the next part of the aircraft. The robots then would be able to upload complete inspection reports with images. Analytics tools could unearth patterns and issues in the reports that lead to improvements in production techniques and materials. Additionally, using robots and smart machines paired with augmented reality (AR) could be a next-generation “process sherpa” for manufacturing. Boeing and Upskill.io used AR to cut the time required by the aviation giant to wire its planes by as much as 25%. Tractor manufacturer Agco is using machines with “informed reality” so that employees have the info they need without a tablet or laptop. Manufacturers that have deployed human-robotics workflows report greater productivity than when humans and robots work independently of each other. The robots generally take on dull, dirty, and repetitive tasks, while human workers focus on tasks requiring greater skills and cognitive abil­ities. And, when it comes to safety, specific processes can be automated by harnessing robotics and smart machines that leverage the Internet of Things (IoT), thus reducing human intervention and increasing workplace safety. The success of these human-robot partnerships can be measured not only by accelerated time to market, reduced costs, and productivity gains, but also by higher sales from increased capacity and line flexibility, and new revenue from agile product configurations and new markets. With analytics insights gleaned from the data generated by these robots, human workers (both operational and managerial) will begin to identify entirely new ways to realize efficiencies (through new assembly processes, for example) as well as new revenue streams through “markets of one” product options. These results are only achievable, however, if manufacturers shift their focus to new skills and mindsets for their workforce. To better understand the changes in work brought on by the influx of new digital technologies such as robotic automation, analytics, and artificial intelligence, we recently conducted a global study of 2,000 executives, including 500 senior executives from the consumer and industrial product spaces. We found that innovation—cited as the most important skill for manufacturers today (70% of respondents)—will grow more vital by 2020 (cited by 80% of respondents). Furthermore, intelligent automation will release a flood of process feedback, spurring a need for analytics skills by 2020 (from 57% today to 75% in 2020). Workers with analytics skills will bring premium assets to manufacturers in multiple ways, such as supply-chain optimization, product quality, and asset optimization. Respondents also anticipate dynamic growth in demand for design skills, with 70% naming this an important skill in 2020, up from 55% today. Human-centered design: Rethinking processes requires an understanding of the social and anthropomorphic context of human-robotics partnerships. How will humans manage their emotions when working with machines that are able to learn yet are not intuitive or creative? Because robots can respond in less than an instant, how will their speed mesh with slower human response times? How will experienced humans, who may intuit a problem, communicate that insight effectively with a mechanical co-worker? Can a robot cracking a joke help reduce a human’s stress level and keep the line running smoothly? Combining industrial engineering and anthropological design principles is necessary to anticipate these types of questions, understand the personas of the humans involved, and create workflows that incorporate responses to such scenarios. New workflows: Many next-gen robots are designed to work out-of-the-box, with application programming interfaces (APIs) for quick customization and deployment. To achieve the full cost and productivity benefits of these robotics strategies, though, manufacturers must rethink their workflows and how robots and humans will interact. For example, a robot might message a human co-worker’s smartwatch to alert her of an otherwise imper­ceptible millisecond slowdown on the line to help avert issues. Or a human’s safety device could signal a rise in temperature to a robot in the cell, triggering an alert. New time-and-motion and ergonomics studies must be conducted to envision how experi­enced, skilled humans and smart robots should partner on such a task. Here again, it is critical to work with industrial engineers and design thinking experts with the skills and experience to develop workflows that take advantage of the unique strengths of humans and robots. Operational integration: It’s also vital to consider how human-robotic units contribute to the rich flow of data generated from production-line workstations and sensors. The new robots can be instrumented (if they are not already) to generate data and thus contribute to an organization’s IoT initiative. It’s also possible to integrate robots with the MES. 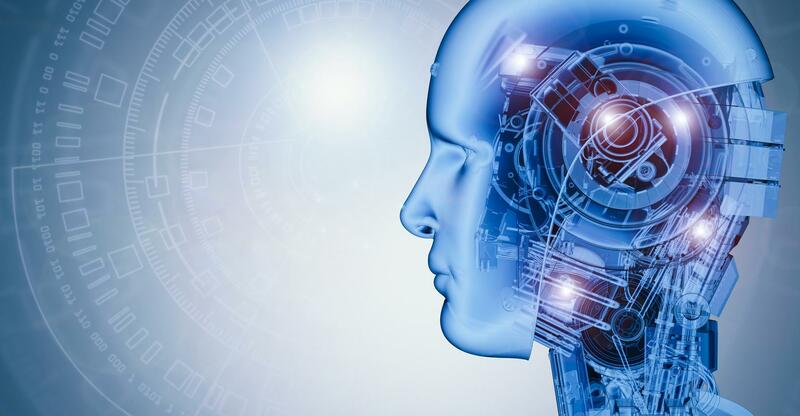 Predictive analytics can reveal insights from the data generated by the integrated human-robotics team, enabling organi­zations to anticipate production events or spark innovation, such as opportunities for customizing a part or finished product. Managing the resulting data requires a high-performance computing environment that can distill and act upon insights in real-time by humans and/or their robot partners. New partnerships: These programs are intertwined with far too many systems for any single company to build or supply a complete solution. Instead, companies will need to pool their complementary strengths. A typical ecosystem could include robot designers and manufacturers, integrated robotics strategy advisors, design thinking experts, systems integrators, digital technology experts, and academic researchers. These emerging ecosystems are not traditional vendor-to-supplier relationships. Rather, they are cross-industry partnerships designed to create and share technological advances, develop new revenue streams, and build new market channels, all while achieving unprecedented cost reductions. Partner ecosystems are emerging in the vendor world (one example is Microsoft and KUKA Robotics), from academia (such as the National Robotics Engineer­ing Center founded by Carnegie Mellon University) and from government sponsors (such as the U.S. Department of Defense’s Advanced Robotics Manufacturing Innovation Hub). From our study, we estimate that digital technologies overall will drive 24.7% additional growth in the $13 trillion manufacturing sector worldwide between now and 2018. Pairing intelligent robots with human workers is just one part of these gains, but it is a vital one. Using a holistic robotics strategy, manufacturers can take full advantage of the intelligence and data flows from the new robots to augment the human workforce, streamline workflows, design new features and products, and open new market channels. The outcome will be unprecedented levels of productivity, innovation, and cost advantage.